In recent years, it has become evident that software is driving innovation and development in practically all industries. The Agile methodology was built to help software development teams keep pace with the accelerating rate of innovation and fast evolving user needs. Scaling Agile across large organizations was, and to some extent, continues to be a problem – but frameworks such as LeSS, DAD and SAFe® help large enterprises make the transition to Agile. Among these, SAFe (the Scaled Agile Framework) can be considered the most popular framework. With the release of SAFe’s latest update 4.0, it’s a good idea to revisit the basics of this framework, and to see how this new version compares to its predecessor 3.0. The Scaled Agile Framework promises to bring widespread benefits to organizations that implement it. By synchronizing alignment, collaboration and delivery for multiple teams, SAFe claims to increase productivity, reduce time to market, and enhance product quality – and its increasing popularity seems to prove that it delivers on these promises. But how exactly does SAFe work? Essentially, SAFe’s basic structure contains 3 or 4 levels depending on the specific needs of the individual organization. The following is a simplified description of SAFe’s architecture. For a more detailed explanation, please scroll down to download our white paper on the Scaled Agile Framework. Team level: At the root of the Scaled Agile Framework are Agile teams working with Scrum or Kanban methods. These teams, consisting of a Scrum Master, a Product Owner, and the Dev team, are responsible for creating small chunks of functionality from their backlog during a number of sprints. Quality assurance is supported by techniques borrowed from eXtreme Programming and Lean development. Program level: 5 to 12 Agile teams (50-125 team members) form an Agile Release Train (ART) on the Program level. Led by a Release Train Engineer, this ART (a long-lived, self-organizing group) helps these teams align to business strategy, and may also be used to monitor progress. ARTs are cross-functional teams that work to define, build and test valuable, working functionality items based on a program backlog every 2 weeks. Value Stream level: This level (which is a new addition to SAFe with the 4.0 release) is optional, and may be used to support the development of large, complex system architectures. Essentially, a Value Stream helps orchestrate the work of multiple ARTs. Portfolio level: As the highest level in SAFe, the Portfolio level organizes multiple value streams. It provides governance, funding, and coordination for all value streams and all the ARTs within them. In other words, Portfolio is essentially what you’d call the management level. In addition to the values and principles that help shape the organizational culture which is key to adopting SAFe, there are certain techniques and practices that enterprises implementing the Scaled Agile Framework use. On the Program and Team levels, the primary method is PI (Program Increment) planning, which clarifies the set of objectives for the next increment. A Product/Solution vision and roadmap is used to guide the feature delivery process, establishing the ART deliverables. Finally, much like retrospective meetings in an Agile environment, Inspect & Adapt workshops are held to reflect on the execution as well as the results of the previous Program Increment. The Portfolio Level serves to provide the funding and governance necessary to achieve business goals. Regardless of how many Portfolios there are (in the case of large enterprises, multiple SAFe portfolios may be necessary), value streams are used to facilitate the processes that enable the enterprise to achieve its mission. An Enterprise Architect works to enable and lead technology initiatives, while Epic Owners lead Portfolio Epics to completion, managing and monitoring work using a Portfolio Kanban. This Kanban system provides transparency and enables the measuring of work to support decision-making. As mentioned above, one of the most important differences between previous versions of the Scaled Agile Framework and its latest revision 4.0 is the addition of an optional new level: the Value Stream level. This level, which brings new roles, activities and artifacts, was designed to help the development of “system of systems” products. In other words, reacting to the changing needs of high-tech companies globally, SAFe is no longer a software-only framework. 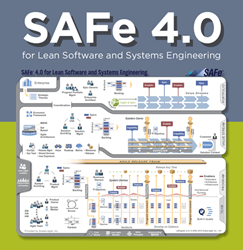 Having the same objective of “future-proofing” development processes in mind, SAFe 4.0 also introduces Enterprise Kanban systems to manage the flow of work across the framework, and its built-in quality practices have also been updated to address both software and systems development. Find out more about how codeBeamer ALM supports SAFe, start your free 30-day trial, or contact us with your questions!